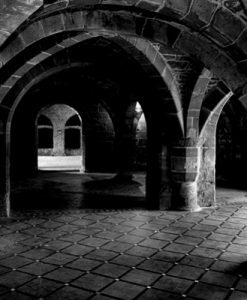 Shropshire is one county which has become very well known for the ghosts that haunt many of the older buildings in the area. 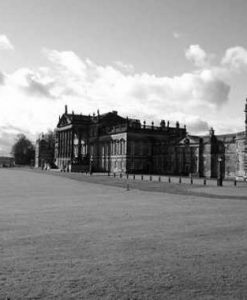 It has been estimated that there could be more than 500 different haunted places in Shropshire including everything from museums to pubs and from swimming to haunted clocks! Whittington Castle sits in the North West of Shropshire. 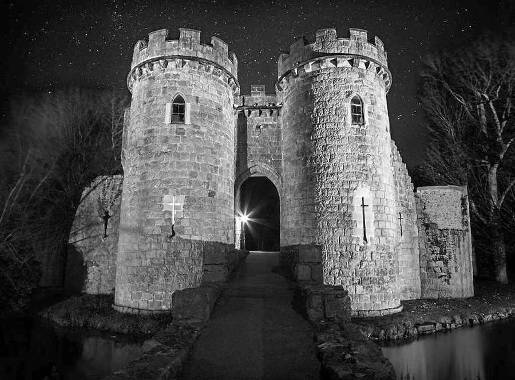 It has a long and colourful history which has culminated in the castle ending up in the very capable hands of Whittington Castle Preservation Fund who open in to the public for most of the year. It is during these public tours that a number of visitors have gotten frightened half to death by the apparition of a man in a hood standing under the gateway! There have also been numerous reports of phantom children staring at people from the bedroom windows. There are also tales of paranormal activity in The Guard’s Room. It it apparently so haunted that most staff members will refuse to enter the room alone at any time. Another common sighting is the tall blacksmith in a traditional leather apron. 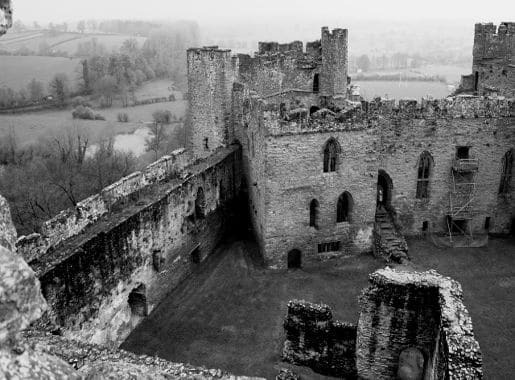 Ludlow Castle is allegedly haunted by the ghost of Marion La Bruyere. She was the lover of an enemy of the castle and was betrayed one evening. She arranged to meet her knight in the high tower of the castle where she slept. Her plan was to lower a rope for him to climb up. It all sounds totally romantic! However, little did Marion know, but her lover had actually been plotting to allow an enemy to limb the rope too. Once this was complete, 100 men stormed the castle and it was ultimately handed over to the enemy. When Marion realised the extent of her knight’s betrayal she pulled his sword and used it to slit his throat before throwing herself out of the window to her death on the rocks below! Marion’s spirit is still spotted from time to time at dusk. It has also been said that if you happen to visit on the anniversary of her death you will also hear her screams as she plunged to her death! 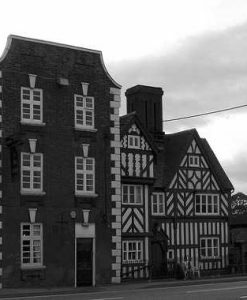 Fitz Manor in Montford Bridge, Shropshire, can be traced all the way back to 1450. It is believed that back then the original building was uses as a Saxon house hall. 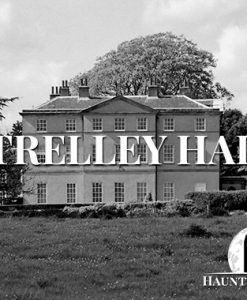 The property fell into the hands of the Bailey family in the 18th century and it is still the same family who own Fitz Manor. These days, the house is operated as a bed and breakfast. It really is no surprise that a house this old has a few ghosts to speak of! Fitz Manor has previously been featured on some of the paranormal television programs. One of the most disturbing tales to come out of the building is that of a homosexual priest who was found out and then crucified against the wall of the drawing room! This has certainly left its mark, because a number of visitors have reported hearing disembodied screaming coming from the drawing room! There are also quite a few more Shropshire ghosts that are said to haunt Fitz Manor including a Victorian lady who appears in the Red room and in the churchyard. The number of sightings in the UK in the last couple of months has risen rapidly to 14! There is apparently a painting of this woman in the attic. The Orange Room is also haunted and on many occasions guest have reported a smell of burning or tobacco! In the small town of Shifnal, just east of Telford you will find the Clock Tower which was originally built in order to make sure that nobody was ever late for work! The go ahead was given to start work, but the Burgess took ill before it was completed. As he lay on his death bed he tried to insist that the Clock Tower should not be completed. However, the town took no notice and on the day following the Burgess’ funeral the construction of the clock tower resumed and it was completed on time! Ever since that day there have been regular reports of a ghostly figure seen climbing or leaping across the clock face. It has been suggested that this is the spirit of the Burgess as he renews his efforts to stop the clock! 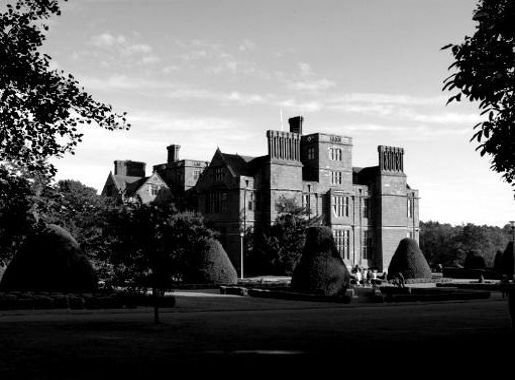 Condover Hall is an elegant Elizabethan sandstone building which is often said to be the grandest manor house in all of Shropshire. It is located in a conservation area just outside of Condover village near the town of Shrewsbury. Over the years it has served a variety of purposes including being a school for the blind, an ‘Officers’ Mess’ for the nearby RAF Condover and it is now an activity centre. It also has a bit of a bloody past! One of the most famous paranormal occurrences that has been reported here is the strange blood stained hand print that randomly appears on the wall of the stairs leading to the basement! The print only appears every now and then, but the generally consensus is that it belongs to Lord Knyvett, who was stabbed and stumbled down to the basement leaving a hand print where he had used the wall to steady himself. No amount of scrubbing will remove the print when it appears and the only solution is to chip out and replace the stained bricks. However, sooner or later it always ends up reappearing! Lord Knyvett’s death was pinned on the butler although some say it was his own son who wielded the knife. The butler was sentenced to death, but before his execution he cursed the family and it is said that there has never been a prosperous heir since then. 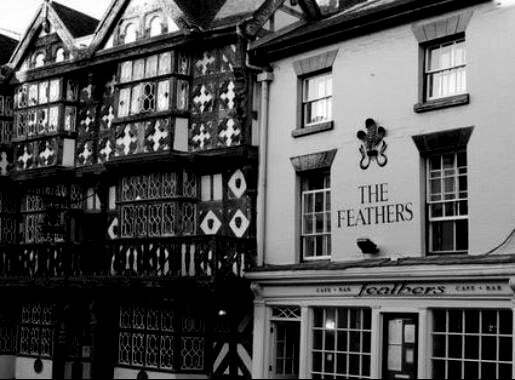 The Feathers Hotel in Ludlow is a 17th century coaching inn which is well known for its famous Tudor beams and its historic past. 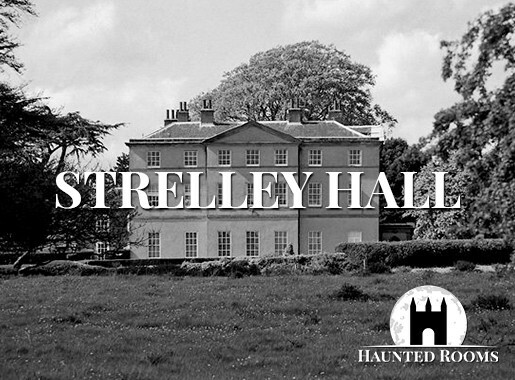 It is also known for being one of the most haunted places in Shropshire. Among the ghosts said to haunt this particular building are a jealous spirit who is not particularly nice towards the ladies, a man and a dog and a scantily clad female spirit wearing a pair of clogs! Well, that is certainly a diverse selection of ghosts. The most haunted spot in the hotel is said to be room 211, where a jealous spirit dwells. He is said to hate women and on one occasion a female guest was dragged fro her bed by her hair. After getting back to sleep, she was woken again with the sensation of a bucket of ice cold water being thrown over her, but the bed remained perfectly dry. While the spirit seemed aggressive towards her, her male partner reported feeling a hand reassuringly patting his cheek while this was happening as if the spirit was reassuring him that he had nothing to fear! There have also been sightings of a man in Victorian clothing walking through rooms 232 and 233 with his dog before vanishing into thin air. Another more contemporary ghost is sometimes seen in the carpark. She is said to be dressed very scantily in a mini skirt, wearing a pair of clogs and she is said to walk through the cars and then fade away! If you would like to stay at The Feathers Hotel, then we can help – maybe you will get lucky and stay in room 211! Prisons have always seemed to be paranormal hotspots. Perhaps it is a result of the pain and suffering that has been seen within those walls. 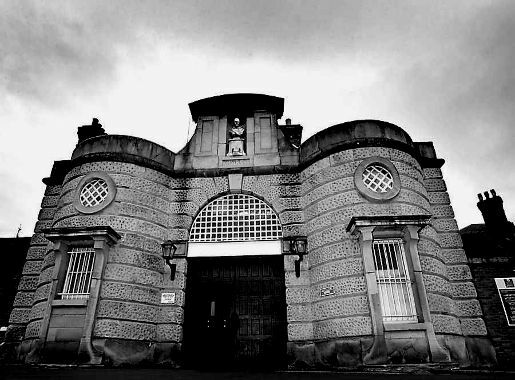 HM Shrewsbury Prison is certainly no exception and it is a must see stop on your tour of the most haunted places in Shropshire! It has only been recently that investigators have had the chance to study the paranormal activity at HM Shrewsbury Prison, so there is no real information regarding who might be responsible for the strange occurrences! There are all sorts of strange reports coming out of the prison including unexplained bangs, cell doors crashing shut, disembodied wailing and so much more!